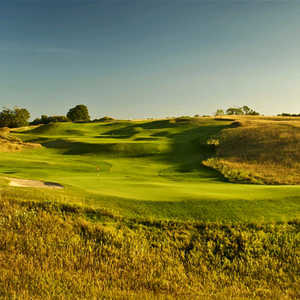 CHARLEVOIX, Mich. - In the last decade, northern Michigan has continued to grow its reputation as a golf mecca of nationally ranked courses in recent years with showy designs like Bay Harbor Golf Club, Arcadia Bluffs Golf Club and Tullymore Golf Club. 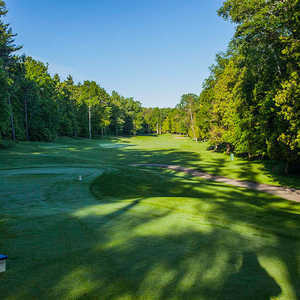 Dunmaglas Golf Course is set on over 800 acres of hilly, forested terrain in northern Michigan. They're all superb additions to the region, but northern Michigan has been a special destination long before they came onto the scene, thanks to hideaway spots like Dunmaglas Golf Course. Dunmaglas Golf Course was ranked as the best public golf course in Michigan by Golf Digest in 1997 and 1998. Though bigger, badder courses have surfaced since then, Dunmaglas remains one of those remote and beautiful northern Michigan golf experiences - with a comparatively pleasing price tag attached. Set on over 800 acres of rolling land mixing forest and open, heathery hillsides, the golf course was built by owner Chuck MacGillivray in 1992, who named the course after his family's ancestral home in Scotland. He commissioned architects Larry Mancour and Dean Refram to build a golf course not necessarily for the masses. "MacGillivray and his friends were low-handicappers and wanted a challenging golf course to play," said Darin Philport, general manager at Dunmaglas. "But word spread about how difficult it was, and people wouldn't come because it was so tough." When MacGillivray came upon financial hardships, he sold the course in 1995 to Mike Pung, and he concluded the course wasn't going to stay afloat unless it was softened a great deal. In the ensuing years, trees were cleared, bunkers were filled in and the course severity was reduced where possible. Today, the course is plenty playable for more than just MacGillivray and his sharp-shooting buddies. It's a modest 6,776 yards from the championship tees and plays to a 73.4/137 slope rating (middle tees 71.6/132). Course officials say the public has started to come back but still only see about 5,000-6,000 rounds annually, far less than the average northern Michigan golf course. But those who visit Dunmaglas today are likely to come back. The hole variety is as exceptional as the never dull land the course sits on, winding through forests, to up and down open hillsides to around ponds and marshes. Holes No. 6 thru 9 offer a real taste of a Scottish heathland course, with tumbling fairways defended on each side by wispy heather, before workings its way back into the forest. No. 14 is the signature hole, a par 4 from an elevated tee on exposed high ground that plays downhill to a fairway cut narrowly in the trees, with a Lake Charlevoix backdrop. Every great northern Michigan golf course worth its salt features a scenic, elevated tee shot, and this is one of the best in the area. While on a whole the layout has been softened, holes 17 and 18 remain brutish par 4s that play over 400 yards and demand water carries on the approach shot. The 18th fairway is just about as narrow as it gets, so it might be worth keeping the driver in the bag. Yes, Dunmaglas still boasts a little teeth. Dunmaglas lacks the exposure of northern Michigan's more better-known golf courses, and its remoteness keeps it a bit under the radar. What this means is that for those who know about it, they're treated to a golf course that's kept its backwoods vibe. Is it too tough for high-handicappers? Hardly. My playing partner on eight northern Michigan courses for the week, about a 20-handicap, spoke glowingly of Dunmaglas following the week above just about everywhere else, which included courses like Forest Dunes Golf Club, Tullymore and Bay Harbor. Peak season green fees at Dunmaglas are $69-79, though you can play midweek and twilight for as low as $39 in the summer months. The Inn at Bay Harbor is just a 15-minute drive east from Dunmaglas and boasts some of the area's best accommodations. Set on Little Traverse Bay, it's a favorite spot to watch the sunset over the bay. Inside, there are a variety of accommodation options from standard guest rooms to suites with up to five beds and spacious balconies overlooking the bay. A full-service spa and numerous dining options are also available on site. 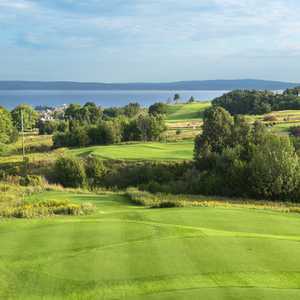 The Boyne Highlands Resort is a little further east across the bay and is home to four golf courses on site. Stay at the lodge, and you'll get discounted package rates on Bay Harbor and seven other Boyne courses in the area, including nearby Boyne Mountain's two golf courses. I have played this course on several different trips up to Michigan. One of my favorite courses to play...anywhere. Challenging but fair and has been made better & better each year. I look forward to my next trip up.